We from Rüegg Kaminstudio Zella-Mehlis want to create your dream fireplace that draws attention to itself and with whom you will feel comfortable. 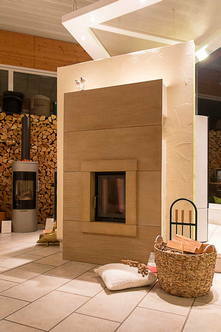 A fireplace whose form fits in the context of your living environment. That’s, what you can expect from us! Cosiness and warmth play a major role for you. Both should be the center point of your home. A small island of shelter that returns much of what is taken by the everyday bustle and stress way too often. Warmth and well-being are among the elementary feelings that Kuhfittig’s stoves, fireplaces and bathrooms convey. A piece of quality of life which you do not wish to renounce any more. To realize this, we will take a lot of time with you to plan and build your dream stove or fireplace, or your dream bathroom. From planning and design, over the selection of optimal materials for your needs, simply tailored through to the artisanal, traditional construction of your new piece of jewelery by our professionals, we are your partner. But also for maintenance and customer service, we are at your service and open to contact from you.